A tankless water heater makes a convenient solution if you want to have unlimited hot water in your home throughout the year. Modern models nowadays are packed with advanced features. Now, we will help you choose between two popular tankless water heaters from the market, which are Navien vs Noritz Tankless Water Heater. Navien was the first company in the world to introduce consumer-grade condensing tankless water heaters. Don’t be confused by the term “condensing”; it is basically just a marketing term for high efficiency that is above 90 percent. Now, Navien is a high-quality brand that is trusted by many people. See also: Navien vs Rinnai Tankless Water Heaters. Navien actually comes from South Korea. The South Korean company produces various home equipment products, including HVAC systems and water heaters. It is interesting that South Korea has a similar climate as the northern area of the United States and Canada. Because of this, some people believe that, Navien’s HVAC systems and water heaters work very well in these countries. The heat exchangers are made of durable stainless steel – take a look at the detailed specs from Navien here. The heat exchangers are very durable. They are warrantied for 15 years. The other parts are warrantied for 5 years. 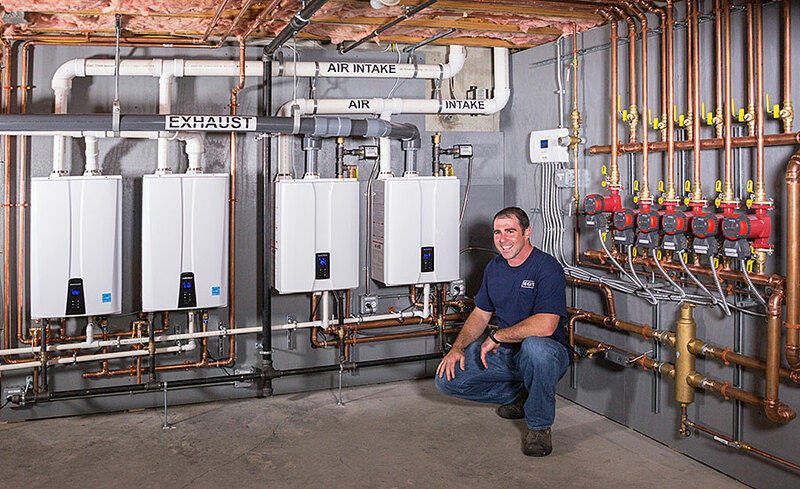 Navien tankless water heaters are preferred by contractors when a very efficient high-capacity system is needed. Navien is currently making the world’s most efficient water heater units. If you are looking for a water heater with the highest efficiency in the market, look for Navien. Navien’s products have been verified for having 97 percent efficiency. What does that mean? A unit uses electricity to generate heat, but not all of the electricity can be used to heat the water. Some power is lost as heat that is emitted to the environment. However, a Navien unit with such a high efficiency can use almost all of the electricity to heat the water. Hence, compared to other models in the market, Navien’s models consume less electricity to produce more hot water. This also means that Navien’s models are environment-friendly, as they don’t waste away energy. Of course, Navien tankless water heaters are known to have superior output rate. Lower quality brands in the market can only give 2 or 3 gallons hot water per minute, and they are unable to provide enough hot water for multiple people bathing simultaneously. However, Navien’s models are much more powerful, able to deliver 10 gallons hot water per minute. So, Navien’s models are suitable for large families and even lodges. Some Navien models are linkable. You can link multiple units to work together in delivering constant hot water. This is very useful for commercial purposes. Navien NPE-240A Premium is a model with such feature. Note that the installation requires venting, but indoor and outdoor installations are both possible thanks to the low-NOx condensing technology. Navien vs Noritz tankless water heater is generally easy to install by a single person. Each model has been optimized for easy installation, and the bundle includes pretty much everything you need to start. There are the mounting and bracket system, 2” PC venting option, buffer tank, and recirculation pump. Navien has a digital interface that is very intuitive. Configuring settings and adjustments on the digital interface is very easy. For example, changing the temperature unit between Celsius and Fahrenheit can be done with just a few hits without needing you to dig through the manual. Noritz is actually not in the same class as Navien. However, this does not mean that Noritz is a bad brand. This means that Noritz is a more accessible choice if you are in a budget. You can consider Navien as the Ferrari of tankless water heaters; Noritz is something like Ford or Toyota. Noritz provides great reliability and durability, but not the luxury and high-end quality. The much lower price tag is the main reason to consider Noritz. Noritz is a Japanese brand. 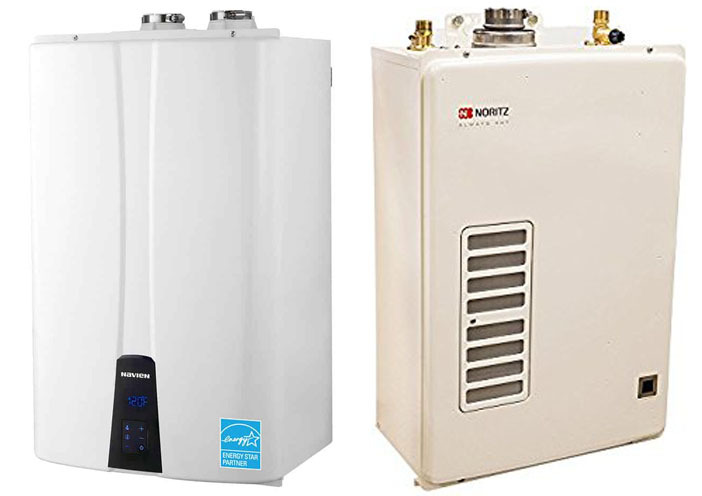 Noritz only manufactures propane and natural gas tankless water heaters. Nevertheless, the reputation is excellent, as they are known for manufacturing top-quality gas tankless water heaters of various sizes. They pride on their impressive warranty timeframes and excellent customer support. Let’s take a look at Noritz 661, which is a popular tankless water heater from the company. It is classifed as a condensing tankless water heater. It captures heat from the exhaust gas in the first heat exchanger and utilizes the heat to preheat the incoming cold water. Then, the water temperature increases while traveling through the second heat exchanger. Such design allows Noritz 661 to be extremely efficient. 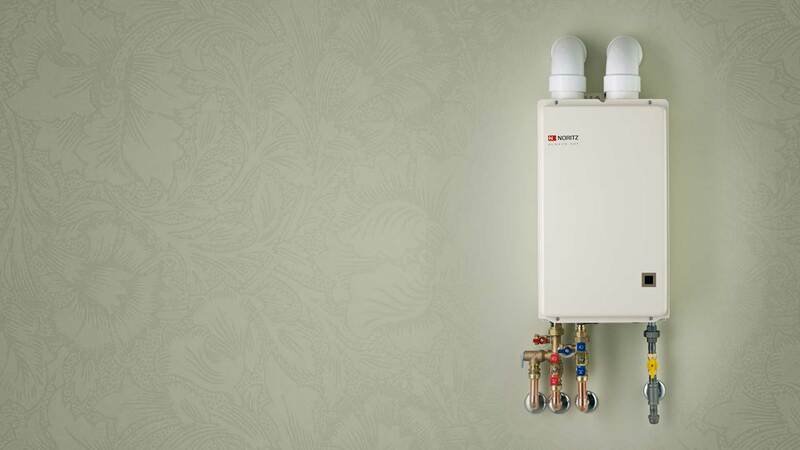 Noritz 661 tankless water heater has an efficiency rating of 0.89 or 89%. This is pretty good, although still lower than Navien. At least, Noritz will not cause a significant jump in your electricity bill. The output rate is good enough for a small family. It can give enough hot water for two people showering at the same time. There are Noritz models suitable for large families and lodges, such as NR111 and NR98. They can deliver hot water as much as 11 GPM and 9.8 GPM, respectively. However, they do consume more electricity. Make sure that you choose a model with the Energy Star certification. Noritz does not have many fancy features. It has traditional controls, so you may need to read the manual to understand how to adjust the settings. Nevertheless, the warranty timeframes are great. It provides a 12-year warranty on the heat exchangers, a 5-year warranty for the other parts, and a 1-year warranty for labor. Navien vs Noritz tankless water heater have different advantages. If you don’t mind spending more money to get the best tankless water heater, you should choose Navien. In the long run, Navien can give greater benefits with the very high efficiency, durability, and convenient controls. However, if you are on a budget, Noritz is a more viable choice. Noritz has a lower price tag, good reliability, and good durability; it is just without the luxury features and ultra-high efficiency.